What about a private cooking lesson for a fun group event or family activity! 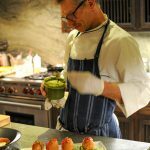 All of our private chefs are passionate about their craft and love sharing their secrets with customers. Learn the basics of traditional European cuisine or try your hand at something more exotic like Thai or Peruvian. Best of all you get to enjoy eating what you make! The sky is the limit as to what you can do. We have run everything from pasta making to sushi preparation. Classes can be small intimate affairs for couples or larger events for groups of friends or a family. Just give us an idea of what you would like to learn and then let our chefs propose a program for you. The only thing to keep in mind is the size of your kitchen for hosting the event, and whether you want it more serious or fun. Within 24 hours, 2-5 chefs submit competing proposals with clear menus and all inclusive prices. You choose the one you like! Your chef comes to your home with all the ingredients, cooks you an awesome meal, and cleans up! Want to split the bill with friends? "Fantastic! What a delight of an evening with the amiable and elegant Chef Rami delivering up an exotic, thought-out, impossibly delicious (and perfectly presented) dinner. We will, for sure, ask him to chef for us again!" Wonderful service that I will definitely use again. Planned a very last minute dinner for two. Within six hours I had three great proposals to choose from. Chef Anthony was amazing. Highly recommend! We used Chef James to cook for our dinner party. His food was amazing! Everyone loved it. Chef Isaiah did a fabulous job preparing a Sicilian feast for my dad’s birthday. It was a creative and fun way to celebrate. Used the service for the first time for a bachelor party this past week. Chef Michelle was great. She was on time, friendly, and made us a fantastic meal! Will look to use the service again in the future. Chef Massimo was absolutely incredible! What an easy process from start to finish. Thank you so much for such a wonderful (and absolutely delicious) evening! Would recommend Table at Home for anyone looking for a personal chef for your dinner or event. The process is seamless. Our chef was personable and professional. The food was amazing! It made our vacation very special! We only accept the best! All Chefs have been background checked, interviewed and had their work reviewed. In addition to being great cooks, our chefs have also been chosen for their interpersonal skills - a very important ingredient in making your dinner a success! Massimo was born in Italy and is a graduate of the Marco Polo Culinary Institute in Genoa, Italy. He has 30+ years experience as a chef, including stints at the Savoy Hotel in London, Louis XII in Monaco, Tre Merli bistro in NYC and Palio Restorante in Long island. "Chef Massimo and his wife Tara went above and beyond! This was my first time using table at home and my first time hiring a chef for an event and it went perfectly. Chef Massimo was on time, clean, professional, personable, and the food was out-of-this world DELICIOUS! We are all still talking about it. I cannot recommend them more highly and cannot wait for my next event to hire him again!" Chef Shawn has been fortunate enough to train under some of the best chefs in the world, Mark Ladner, Mario Batali, Sean Brock, April Bloomfield, Christina Lecki and more. The lessons and time spent learning in these kitchens has given him a modern and clean style, centered around the best ingredients. In addition he owns a small farm in upstate NY, where he sources many of his ingredients - all organic vegetables and ethically gown. "Chef Shawn prepared a delicious meal for my husband and I. The ingredients were fresh from his farm and other local sources. Chef Shawn even welcomed my husband joining in on the cooking so he could learn a few tricks (hello, bacon jam!). His company was also as good as his food. If you're a foodie, pester him with questions!" After a successful stint as a musician (winning 2 Latin American Grammys), Rodrigo followed his passion and studied culinary arts. Since then he has worked in several top kitchen such as Gaggan, Gramercy Tavern and Morimoto. His love is blending Latin, Asian and European techniques to create twists on classics. Most of all he loves the gratification from seeing peoples faces light up when they enjoy his creations. "Chef Rodrigo was absolutely outstanding!!! I honestly struggle to find words to describe how great the meal was. In fact, calling it a meal is insulting....it was an Michelin level EXPERIENCE. Chef Rodrigo makes everything himself, with flawless technique and deep flavors. Plus, he was a courteous and consummate host"
Chef Isaiah started his cooking career a little unconventionally - in the military. Over 13 years, he worked his way up to become a private chef for several Generals and has served senior leaders and heads of state in Iceland, Italy, Denmark and of course the US. His style is thoroughly modern and very international - reflecting all the travel he has done. Plus he has a real passion for using sustainable ingredients, sourced locally. "Chef Isaiah was AMAZING. Five star dining in the comfort of your own home. His attention to detail in plating, knowledge of the food and presentation was one of my best dining experiences." Chef James has over 20 years of experience in London, Miami, Boston, San Francisco and now his current home - Chicago. His style is an eclectic and contemporary, reflecting the time he has spent under some very talented chefs such as Tom Collichio (Craft and Top Chef), The Roux Brothers (Le Gavroche in London) and Hiro Sone (Terra in Napa Valley). "Chef James was a pleasure and made our dinner extra special from beginning to end. He didn't mind us watching and asking questions and it was so much fun to see and learn about behind the scene preparations that chefs have to do. His plated presentations were colorful and full of flavor. I can only dream of him cooking for me everyday"
Chef Brenda has spent a large part of her 15 year cooking career working as a Private Chef on yachts, cruising numerous places around the world, including the Mediterranean and the Caribbean. Along the way, she has picked up an eclectic cooking style, making the best of local ingredients. One of her passions is to practice traditional food practices like pickling and fermenting, which she uses to give a real unique personal touch to her meals. "Brenda was amazing. From start to finish the process, interaction, and meal was out of this world. Her food is so creative, her personality is fun and festive, and her level of professionalism is second to none. It was an absolutely perfect meal and experience." Kisha studied Advanced Culinary Arts at Stratford University. For the last 5 years, Kisha has worked non stop as a personal chef, preparing beautiful and innovative Modern American cuisine. She is also a bit of a competitor, as a contestant on the Food Network show Fakers vs. Bakers. "The dinning experience could not have been any better. I was able to speak with Chef Kisha a few days before the dinner and we worked through all of the details. On the day of the event Chef Kisha ensured to communicate updates regularly. She arrived with everything she needed to prepare what turned out to be one of the best meals I have ever experienced. She plated the meals very well and the presentations were excellent." Chef Asheesh is originally from the UK, and along the way to LA has worked at some of the worlds most well regarded establishments including La Chateu in France and Contigi in Italy - both Michelin star restaurants. He has also cooking for some quite well known people - having been a sous chef at 2 Royal Palaces - Kensington and Buckingham. His style is classic European with a Eastern twist, and he has a real passion for rich sauces. "Incredible food, incredible company and a great night for us and our family. I would definitely recommend him, and we'll be using Asheesh again - next week actually!" Travis has been cooking professionally in the San Diego and OC area for over 13 years. Italian is his favorite cuisine, especially fresh pasta, but he also loves to bring Japanese influences to his cooking - specifically to contrast delicate flavors and ingredients. Multi course plated dinner parties and tasting menus are where his creativity and hospitality best shine! "Chef Travis was amazing! Preparing a meal beyond expectation...complete silence for the first minute or so as everyone’s eyes rolled into the backs of their heads after that first taste, followed by a huge round of applause for our incredible chef! He was also very engaging and chatted with all our crazy guests. He was the hit of the party. " For each city / metro area, our service area extends in a roughly 30 mile radius from the city center. Please try your zip code on our Request a meal page to see if we have chefs who service your home.